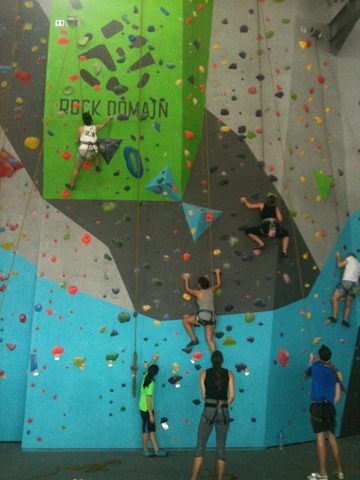 This past Saturday, we went climbing at Rock Domain, a newish climbing gym in the Bangna area of Bangkok (a lot of words start with a Bang here). 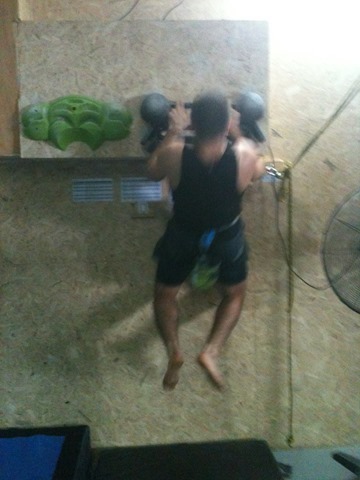 I used to climb quite often while I was in university, but I haven’t gone once since we moved to Bangkok. This soon became painfully obvious. Nothing like heaving yourself up a wall over and over again to A) remind you that there were too many Magnum bars and not enough weightlifting during your now long past pregnancy, and B) make you ponder the futility of human existence a la the book of Ecclesiastes. Oh wow. That is way deeper than I wanted to go. Let’s go back to the frivolity. 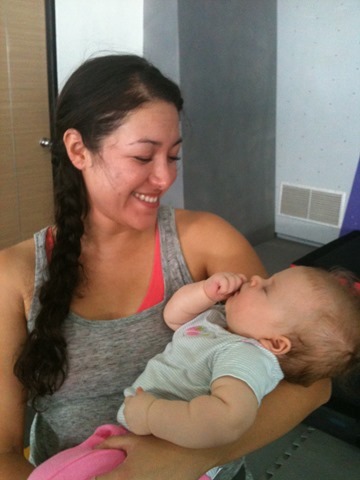 We met up with our friends Michele and Leah at the gym. Michele and her muscles appeared on my blog a long time ago. Hmmm… this seems like the perfect chance to reuse one of my all-time favourite photo series: Michele teaching our friend Sean how to do a cheerleading lift. I was going to add captions, but really, the photos say it for me. She still likes to throw people around, but her guns have gotten even gunnier since those days. If you gave me some muscles’n’posture, I could almost be her twin! After a few climbs, I gave up all pretence of keeping up with her. 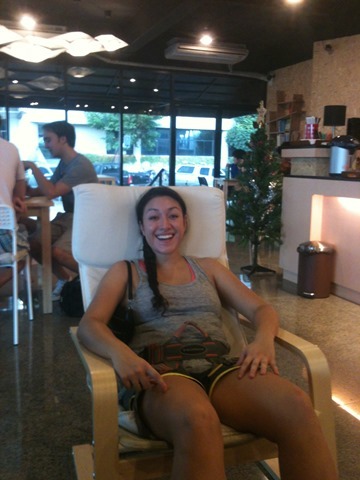 Fortunately, her CrossFit buddy Ben soon joined us. They alternated between climbing some of the most difficult routes in the place, and doing 2-fingered pull-ups during their breaks. 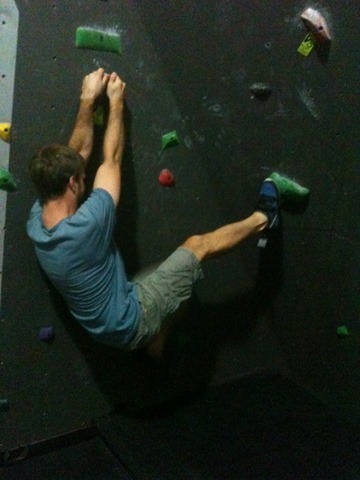 Lucky for me, Leah is new to climbing, so she and I took a more relaxed approach. During one of her breaks, she somehow managed to put my child to sleep in her arms, a feat that I have not yet accomplished. I am still awestruck. Not sure what is going on in this photo, but I think Leah might be gloating. 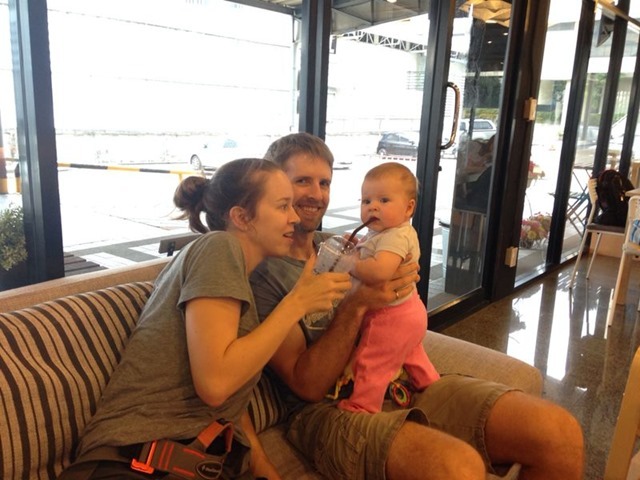 Todd was a daddy extraordinaire, and looked after Zoe while I climbed. 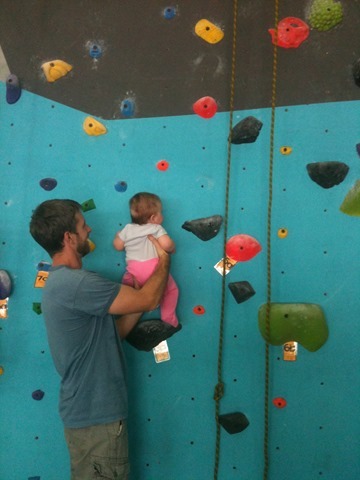 He managed to find a few moments to do a little bouldering, and to introduce Zoe to the wall. It’s never too young to start good habits, right? 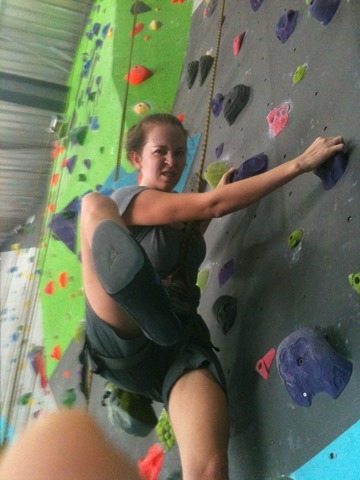 Zoe free soloing her first climb. I was pretty impressed by the set-up at Rock Domain: there are loads of top-roped routes at varying levels of difficulty, lots of lead-climbing routes, and a big bouldering area. 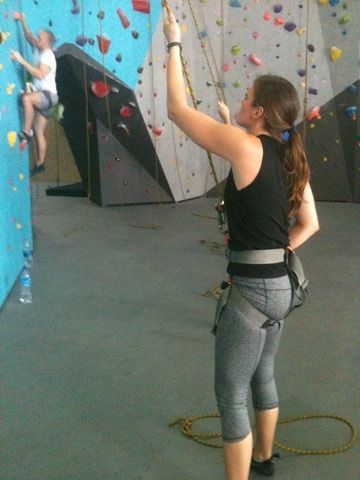 You can rent any equipment you might need, and the staff can teach you how to belay. 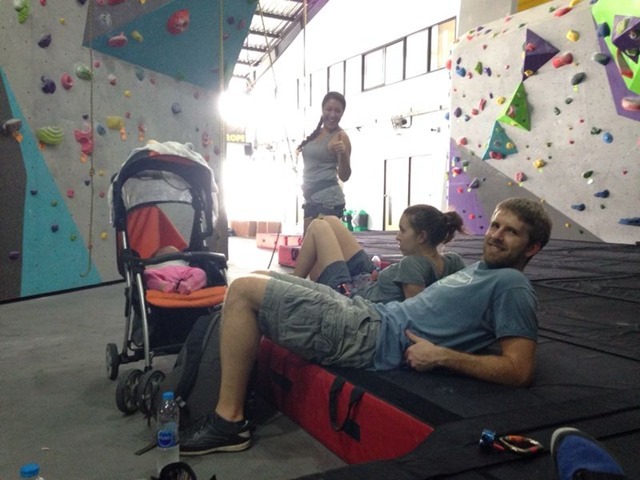 It would make for a great day out – we noticed groups of friends, what looked like some awkward dates, and a few daddy-daughter combos (they are not paying me to say this – I was just really, really happy to find such a great climbing centre in Bangkok). 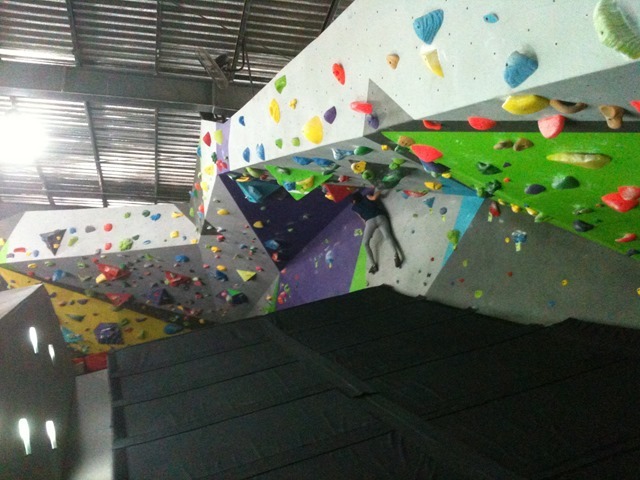 Part of the bouldering area. It’s not just my crappy photography skills – it’s actually on a slope. Oh, and the cute cafe next door, intriguingly named My Secret Place. Because you never know when you might secretly need some coffee and a weird tuna pastry to fuel those climbs. And no one should know about your tuna pastry habit unless you want to tell them. AND we secretly feed our child chocolate banana frappes. Here is the link to Rock Domain. It is almost invisible from Bangna Trat, so be sure to check out the map, and get your taxi driver to talk to the staff at the gym if you get confused. Sorry for the long gaps between posts, folks! I’m sure you’ve all been waiting with bated breath for the latest episode of “Ruth’n’T-bone do life.” Not to worry – after weeks of assorted traveling, I am back with a vengeance. The day after I arrived home from Cambodia, we flipped a u-turn and headed back to the airport to pick up our most favourite Jenny’n’Sean(y). These renaissance souls are on their way back to Canuckistan after spending a year in India working at assorted NGOs. They rightly concluded that nothing would soothe their dithered souls like a week spent in the presence of Pure Sanity (ie: Me and T-Bone). Our time together began with a 20 hour, non-AC, urine-scented train trip. We learned that this particular train always runs 4 hours late – changing the schedules to reflect this would apparently ruin the beautiful mystery that is Thai train travel. The four of us headed up to Chiang Mai, a city in Northern Thailand. Being the precise planner that I am, we had no clue what we would do when we got there, but we knew it would be good. The first day involved a lot of eating, and not much else. Starting with breakfast, stopping never. Our eating habits were threatening to blow our budget, so we booked a three-day jungle trek. This involved a highly sophisticated selection process of flipping through brochures at our guest house and choosing the cheapest option. The trek began with a quick elephant ride. The smiles are hiding sheer terror. The top of an elephant is a long way up. Our first night was spent in a straw hut in a hill-tribe village, complete with spiders and other critters. Our trekking crew in the middle of a sophisticated Thai game that involved painting unibrows on each others’ faces with charcoal. The next day involved swimming in waterfalls and jungle trekking. Finally, a shower with actual water pressure! Trying to remember how to swim. It also involved numerous, numerous random stops by our guide, who was determined to carve cups out of bamboo for all of us, whether we wanted them or not. This involved many, many carving breaks. We passed the time by doing stupid stuff. And wrapping our lunches in banana leaves. And introducing my pet crocodile to assorted dogs. The second night was spent in a dark hut in a dank jungle on filthy beds with filthy blankets. It was a moist, clammy night. I dig authentic travel. After a 30 minute rafting trip (yay budget travel!) led by guides of unknown certification, we piled into a Song Taew and headed back to Chiang Mai for one more night of extended eating. We were feeling melancholy about the end of our trip, until we received an unexpected early morning wake-up call: the Germans next door to us brought a couple of prostitutes back to the hotel, and engaged in Cacophonous Copulation for what seemed to be hours, then spent additional time haggling over the price. Try that again and you’ll be meeting my javelin. 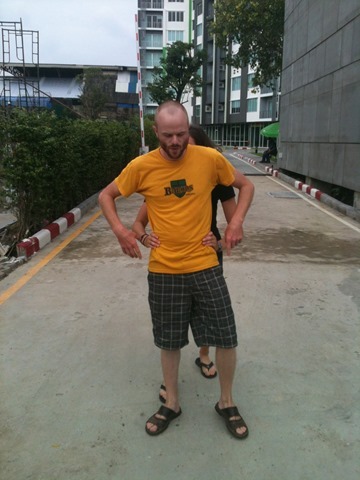 With that, we decided we were ready to leave Chiang Mai after all. Back to southern climes! And one bonus photo of a jumping jungle spider. Much smaller than the one that was crawling on the floor of our straw hut.